Located in the northern section of the park, Pakuba Safari Lodge presents a memorable mid-range accommodation in Murchison Falls National Park for the overnight stay of Uganda safari undertakers. Pakuba Safari lodge enjoys an ideal location that favors rewarding wild game viewing. Its position at the far end of the northern section in an area that seem to have originally been the overnight place for the animals themselves present a remarkable location for viewing wild game than any other lodge in Murchison as always encountered by travelers on safaris in Uganda. 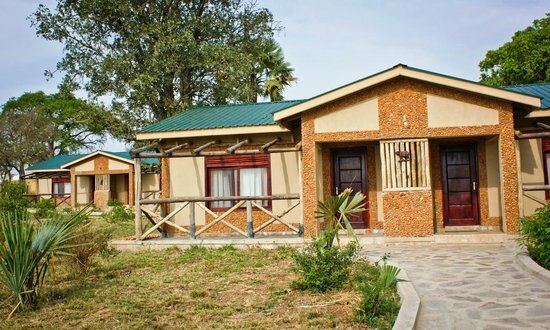 Pakuba Safari Lodge offers accommodation to world travelers on safaris to Uganda in a range of forty six (46) rooms which are self-contained and spacious. The twenty seven (27) of these feature twin beds, twelve (12) feature double rooms while the remaining seven (7) are interconnecting rooms that are suitable for families. As a result of its location, it is not surprising to wake to the sight of the King of the jungle crossing in front of the lodge or the elephants resting in the compound. The buffaloes tend not stay far from the lodge while other wild game including Giraffes, Kobs Jackson’s Hartebeest are seen in the late evening and in the early morning near the Pakuba Safari Lodge environs. The lions which are among the big five land animals normally sought after by travelers on are believed to be living in the old building of the former Pakuba Game Lodge which is at a close range with the Pakuba Safari Lodge. The lodge also offers conference facilities and its scenic view of the Nile River present the conference attendees with a remarkable refresh during the breaks while the evening drive after the end of their sessions in the northern section of the park where abundant wild game is known to thrive generate a memorable excitement. These combine to generate to qualify Pakuba Safari lodge as a unique lodge when it comes to location and better opportunities for wild game viewing in Murchison Falls National Park.